The Vietnamese mossy frog possesses what is thought by some to be the most elaborate camouflage in the entire animal kingdom. 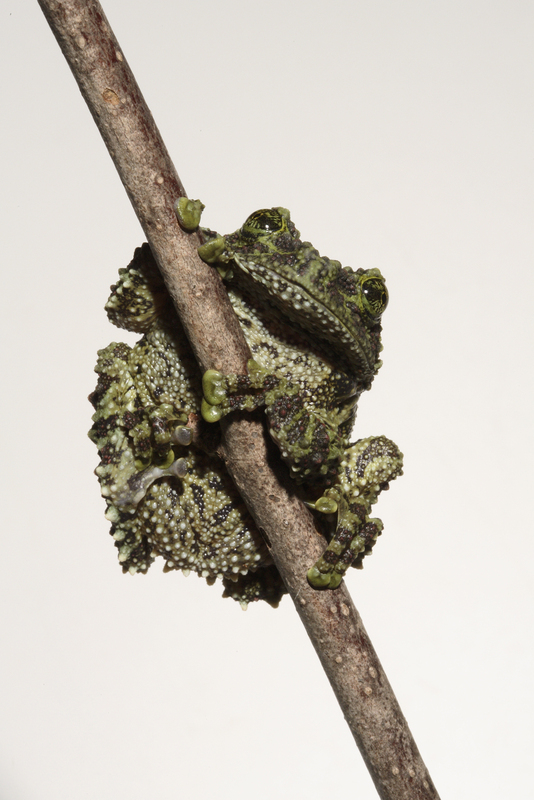 Its uneven, bumpy and multi-colored skin is designed to make this frog resemble moss or lichen. By simply remaining immobile, this frog can blend almost perfectly with its surroundings and go undetected by predators. And if that was not protection enough, this little frog has one last trick up its sleeve. When frightened, the Vietnamese mossy frog will curl up in a ball and pretend it is dead to avoid further harm. When it is time to reproduce, the female will lay her eggs on a rock or leaf just above the surface of the water to keep them out of reach of aquatic predators. When the eggs hatch, the larvae will fall from the eggs into the water and change from tadpole to adult in about one year. Photo credit: Brian Gratwicke, Panama Amphibian Rescue and Conservation Project. This entry was posted in biodiversity, Cute Frog of the Week, why frogs matter and tagged Cute Frog of the Week, Theloderma corticale, Vietnamese mossy frog by Lindsay. Bookmark the permalink.